In 1867, Charles Dickens took the stage at the Tremont Theatre in Boston to read aloud from his new work. Two hours later, as the reportedly enraptured audience left the auditorium, did they realize they had just heard one of the most enduring Christmas stories of all time? A Christmas Carol read aloud, by Dickens himself, inside of a building which now sports a façade made to look as much as possible like the Doge’s Palace in Venice. What is going on here? Every time I walk past Boston’s rather startling version of The Doge’s Palace, I think about how amazing that lecture must have been and as I look up at that distinctive unmistakably Venetian pattern of pink brick, I wonder how in the world Boston and Venice became so inextricably (and so evocatively) linked? 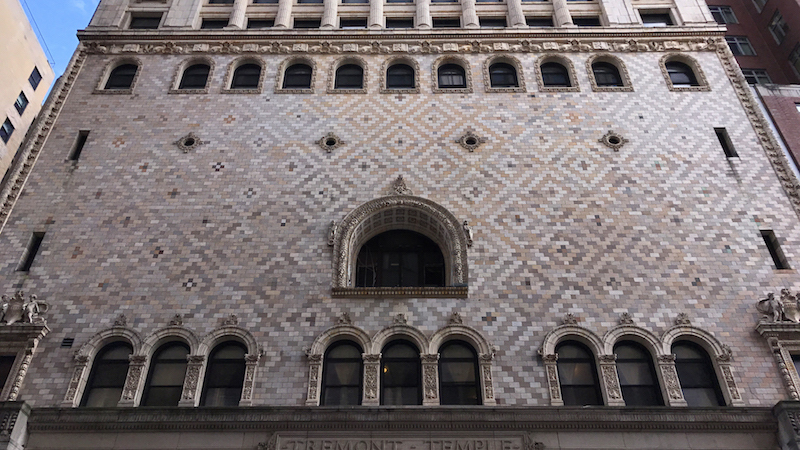 The pink brick pattern and some of the Gothic ornamentation of the Tremont Temple in Boston (above) is based upon the Doge’s Palace in Venice’s St. Mark’s Square. Because I’m lucky enough to spend some of my time every year in both of these seaside cities this research has been a joy to investigate. Turns out, the current Tremont Temple (former Tremont Theatre) was put up in 1897, some 30 years after Dickens’ historic reading. When you live in historic cities you are used to such reincarnations. Like Venice’s famous opera house La Fenice (the Phoenix), the Tremont Theatre was plagued by recurring fires. By 1897, a more substantial stone building seemed the right solution and Boston’s fascination with Venice was in the air. 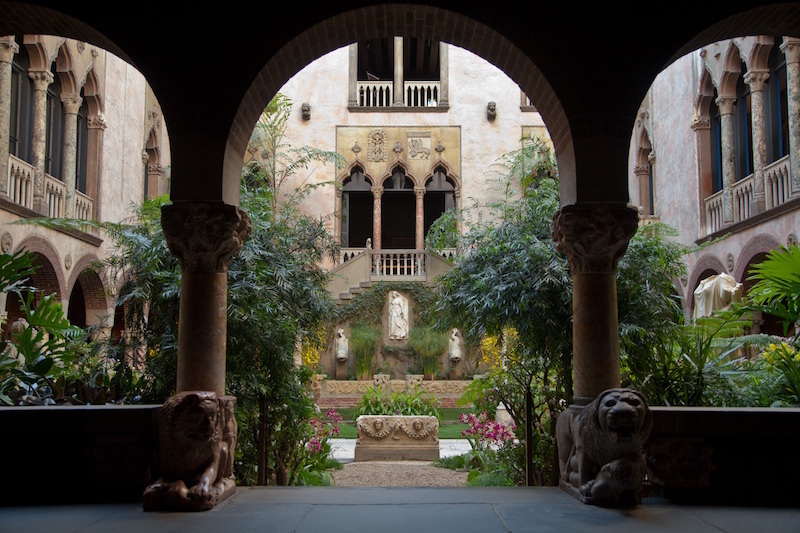 Look no further than the magnificent 15th Century Venetian palazzo of the Isabella Stewart Gardner museum. How on earth did that end up in Boston? The garden at the Isabella Stewart Gardner Museum is the delightful result of one Bostonian’s Venice obsession. We know certain things. 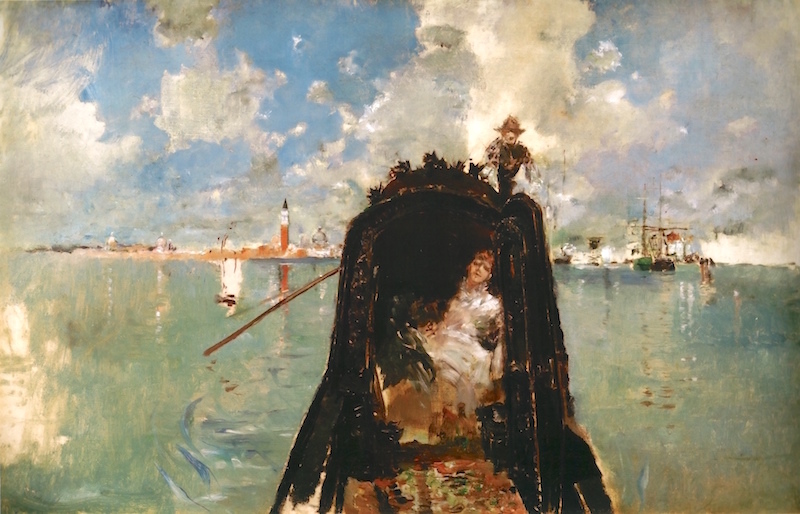 Isabella Stewart Gardner adored Venice. How and why did that love affair begin and why did Venice fire the imaginations of so many other Bostonians? You know how sometimes when you first meet someone, whether or not you actually believe in reincarnation, you feel as though you knew each other in a past life? I think that vague sense of déjà vu and instantaneous “like minds” is what the Italians mean when they describe you (or something they like) as simpatico. I maintain Venice and Boston are simpatico in much the same way. They are somehow connected with a quasi-spiritual link forged in a rich intellectual life. Mark Twain said of Boston, “In Philadelphia, they ask, who were his parents? In New York, how much is he worth? In Boston they ask, how much does he know?” Both Boston and Venice are known for their love of education and books. Venice was the publishing heart of Italy and the Old World. By the turn of the 15th Century, there were more than twice as many books being published in Venice than in Paris. Both Boston and Venice feature important libraries on their central squares. The Biblioteca Marciana, founded in Venice in 1468, is a book lovers dream and houses one of the most important archives of the Old World. For the New World, the Boston Public Library, founded in 1852, was the first metropolitan library in America and, for many, signaled the dawn of a democratized American enlightenment. 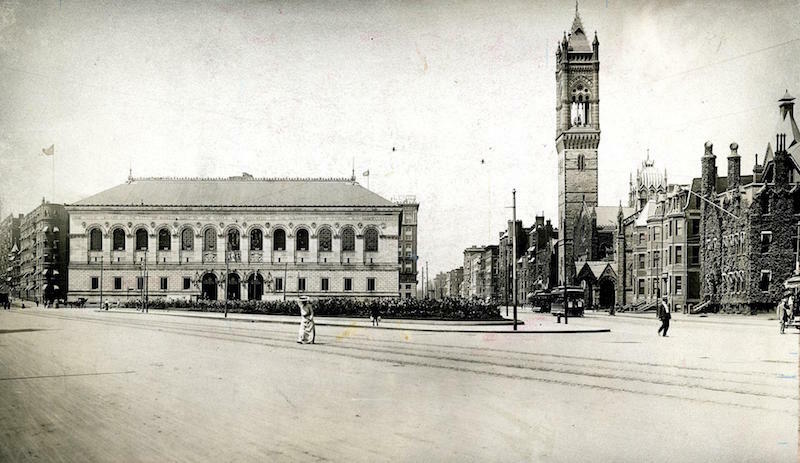 The Boston Public Library’s McKimm building on Copley Square as it appeared shortly after its construction in 1895. Photo courtesy of The Boston Public Library. 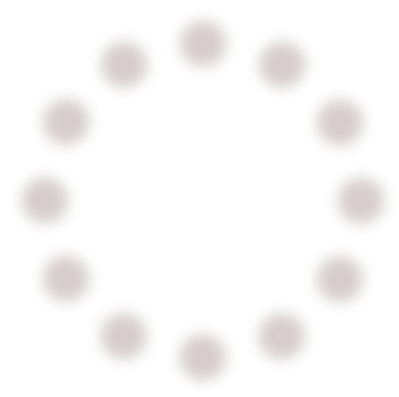 The quasi-spiritual connection is Humanism and a love of the arts born of their cosmopolitan sophistication as centers of import/export trade and rich cultural exchange. Both cities are cultural crossroads. And here is where the real fun begins. To research this further, I asked Frederick Ilchman, who is the Chairman of Save Venice, about the curious cultural connections of Boston and Venice. I’ve known Frederick for twenty years, meeting him first in Venice when he was working on his dissertation. He is now also Chair, Art of Europe at the Museum of Fine Arts, Boston and is among the top Tintoretto scholars in the world. If anyone would know, he would. The 1849 façade of the Boston Athenaeum (far right) is based on Palladio’s 1544 Palazzo da Porta Festa (far left) in nearby Vicenza. The New Yorker, Henry James, author of, The Bostonians, is perhaps the most articulate of Venice’s many lovers. He immortalized the beguiling atmosphere of Venice in his novels, The Wings of the Dove and The Aspern Papers. 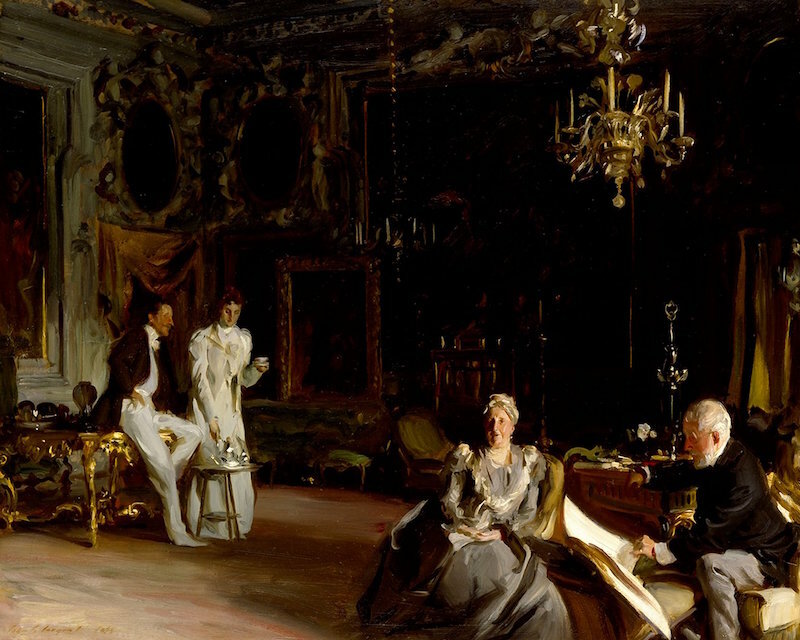 If Henry James supplied the words then John Singer Sargent provided the pictures. The place was provided by Ralph and Ariana Curtis, who bought a famous palazzo on the Grand Canal and entertained these people in lavish Venetian style. The Palazzo Barbaro is actually two palaces very close to today’s Accademia Bridge in Venice. On the right is a rare archival photograph of Ralph and Ariana Curtis inside the Palazzo Barbaro. Interesting to compare it to Sargent’s famous oil painting below. I don’t know if you believe that people have auras but do you believe that a place can have an aura? Maybe a more modern word would be vibe; certainly you would agree places have an atmosphere. One writer who captures atmosphere exquisitely is John Berendt. His Midnight in the Garden of Good and Evil (1994) is still bringing eager visitors to Savannah, Georgia years after it became the NYT’s longest running best seller. Berendt’s long-awaited second book, The City of Falling Angels, is about Venice and according to him, and many others, the place perhaps most evocative for the Venice/Boston connection are two historic palazzi on the Grand Canal near the Academia Bridge collectively called the Palazzo Barbaro (originally constructed in 1425 and 1465). The Barbaro family were humanists on a grand scale on the Grand Canal. Why did the Curtis’ leave Boston? According to a superb essay in an exhibition catalog called Gondola Days by Richard Lingner (which was borrowed from heavily in the construction of John Berendt’s book) there were several factors. One was how life was changing in America after the Civil War. From Lingner’s research you get the feeling the Curtises were bored with rich and aimless Americans. They felt America was in cultural decline. Europe seemed more sophisticated. Daniel Curtis felt some of his friends were uninterested in conversations if, “business and money were not paramount topics.” They were looking for intellectual stimulation and Venice gave it to them. Anthony Edwards and Jeremy Irons (left) lean on the balcony of the Palazzo Barbaro as they appeared in unforgettable episodes in the BBC’s Brideshead Revisited (1981). On the right is the same balcony from the film adaptation of Henry James’ Wings of the Dove (1997) starring Helena Bonham Carter. In many ways Palazzo Barbaro became a powerful and iconic symbol of Venetian elegance. Sargent’s famous interior view shimmers with that molto famoso Venetian light which Gore Vidal described tongue-in-cheek as nacreous (iridescent). As if that image weren’t haunting enough, the Palazzo became even more cinematic in unforgettable episodes of the BBC’s Brideshead Revisited and the 1997 film adaptation of Wings of the Dove with Helena Bonham Carter in the breakout role of her career. Isabella Stewart Gardner was a frequent guest of the Curtises. 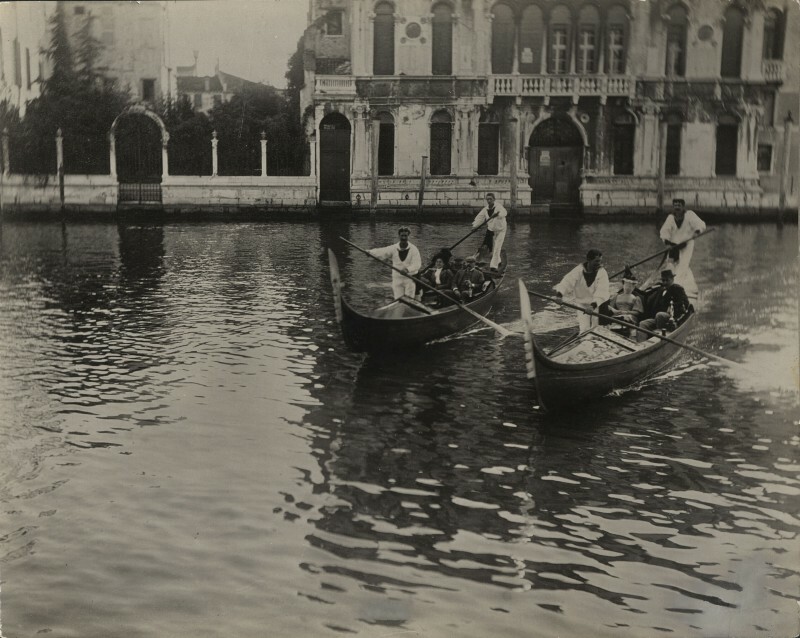 In this archival photograph they enjoy “gondola days” on the Grand Canal in the late 1880s. Imagine summer “gondola filled” days in Venice at that time. No wonder she decided on an Italian theme for her new museum to be built on the marshy Fenway back in Boston. She and her husband had originally wanted to expand a house on Beacon Street for this purpose but those plans turned out to be impractical. Not enough space for her burgeoning collection. She wanted the building to be completely constructed of stone. Surely if the buildings in Venice could last for hundreds of years her new building in Boston could be constructed with the same techniques. The Boston Building Inspector had other ideas. I’m not sure exactly who won but I like the idea that she wanted something truly Venetian right down to the foundations of wooden pilings. Thank you for sharing this beautifully written essay. A very rewarding read, if a little more linear than your usual “conversations.” I had not thought of this comparison, but it is wonderfully illuminating about how we are impacted by art and place. As Martina noted, these two cities were/are “built on seafaring entrepreneurial adventures,” both great centers of commerce that aggressively encountered the world and reaped the benefits. A further opportunity for the comparison to explore the relationship of commerce and art? Hope you are enjoying your holidays and wish you a happy and healthy new year. Oh, Tom! The first time I was in Venice was the last day of Carnival – a warm February day – perfect for a first view. Then, overnight the fog rolled in casting mystery everywhere. Tendrils of fog wrapped around the pillars of the palaces, and out of the fog, high on a balcony, two revelers appeared in full, masked splendor, then quickly disappeared into the misty morning. The second visit, last July, in 100 degree heat, we stayed in the Don Orione Monastery Hotel just behind the Accademia – a perfect location. The Blum painting of such a fashionable lady in 1887, in the summer, brought to mind the absolutely wilting heat. She would have been wearing, from the skin out, a chemise, stockings, drawers, corset, corset cover, bustle, petticoat and finally her fashionable summer dress. All of the finery may well account for her seemingly wilting posture. I only hope that the gondola was catching the sea breeze. This is a wonderful reflection! I love the Frederick Blum painting, and the word ‘nacreous”. It seems to me that both Boston and Venice were built on seafaring entreprenurial adventures, and the money they made allowed them to take much pleasure in art, which has given us the treasures in both places. And the light, as you have pointed out in the past, is made different, due to the moisture in the air, and there is just something golden, and tinged with rose, in the way the light hits the buildings in Venice. 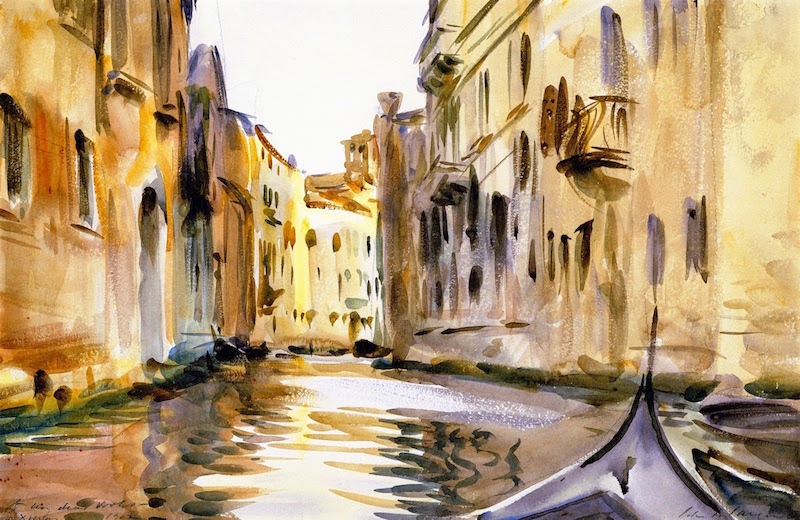 I did not know that Sargent spent time there, but of course, he would have loved it, and I love that quickly sketched watercolor view of the canal you posted. I remember reading about Henry James in Venice, and the desk looking out of one of those grand windows, at the Grand Canal, the light, the inspiration, the heavy massive frames of walls, windows, paintings, and that nacreous light. Thanks for another provocative and intriguing posting. I hope you have a wonderful holiday and year ahead. I agree with Juan, please keep sharing your terrific blogs! What a great idea to pair Venice and Boston together! Both centers of culture and beauty, I can see how both provide inspiration and history for everyone to enjoy. Having been in both cities many times, visiting the Isabelle Stewart Gardner Museum is stepping indeed in an unforgettable experience. The magnificent court yard, and seeing the Sargents, provide a great welcoming effect. I have started reading Gore Vidal’s “Venice” book, which certainly sets a great bridge between Americans love for Venice of yesteryear. 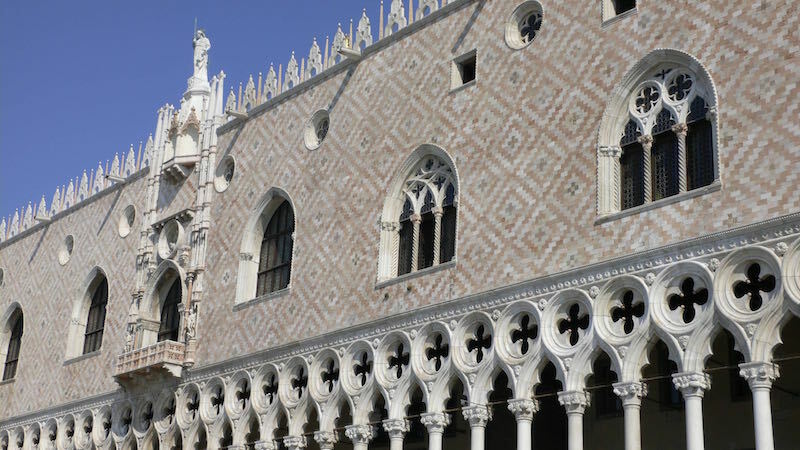 Thank you for making a point of the Tremont Temple and the Doges Palace…It’s fascinating the love affair for Italian architecture in this country. I live in Los Angeles, and UCLA’s campus architecture was based on the 12th century Romanesque style of the warm land of Southern Italy. Thank you so much for the marvellous pictures and research. Wishing you the best for the Holidays and please keep sharing your terrific blogs. Dear Tommaso, I always love seeing the world through your eyes! The exquisite photography you paired with these thoughtful and unexpected comparisons was such a treat on this gray, slushy morning. Now, I’m dreaming of a gondola filled summer!